Follow Friday Question of the Week:Go count the number of unread books sitting on your shelf. How many? Ummm...I'm not at home to look at my bookshelf but I have 156 books on my iPad (still geeking because I have an iPad!). On top of that I have 56 Accepted Review Requests!! The last time we had to count a couple of months ago, I had 46 books on my TBR list. Hmmm...blogging...has made my addiction to books so much worse. Hi!! Welcome everyone who stops by. If you have a chance take a look around :) I'm really looking forward to hopping. Figured had to get have some fun before starting school next week. If you have problems commenting, click on the title and it works. I'm working on it, I promise. Thank you for the Topics for Why I Love Wednesdays!! I really appreciated the help. We were able to generate 53 topic ideas. How awesome is that?! Oh and be sure to visit this week's features, the lovely Book Den and Pawing through Books. 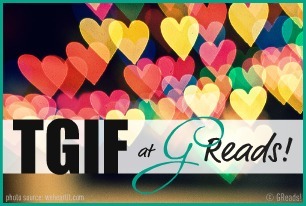 TGIF at GReads Question of the Week:What are some of your reading goals for the new year? Well I set a goal to read 75 books on the GoodReads challenge which is more than the 60 book goal I set last year but still fewer than 84 books I read last year. I really want to get more reading time in. I spend too much time blogging and not enough time reading and I don't really like that. I want to venture out of my comfort zone and try other genres like steampunk, zombie books, and I'm still looking for that perfect ghost book. I want to read some of the books on my bookshelf. Many of them are books I bought because of recommendations of other bloggers. Others are some that I saw in a book store and had to have. I want to read them. I really do. I look forward to reading more from you and have a Happy Friday! Ohhh thanks foe the recommendations. I'm going to look into those and probably buy a few. It's hard to keep a balance. I put off reading till I get my blog stuff done. Then it's late and I go to bed. The cycle is the same each day. Yes, the ebooks can be tricky and certainly increase the number of your TBR pile! It's just to easy to click and buy! I especially love the free books...those are addictive to me! Okay, enough complaining! Here's to a successful reading year in 2012! Happy Friday to you as well. I feel guilty when I buy books now. But I probably won't ever run out. I know! It is insane but I Can't stop. I know! I got gift cards as gifts so it will only get worse. But I'm going to read them. I really really am. Haha! Those vamps will do it to you. OMG your TBR pile is about the same as mine...maybe even worse! And the sad thing is...I'm off to buy more books in the next couple of days because I have a gift certificate! Hope you get more reading done since that's your goal! Great post!!! New follower! I love your blog, its so cute. Yet another surprise. I should have known but I just didn't think about it. I know! Isn't it crazy? It got crazy when I was in a reading funk for pretty much 3 months and it is a bit overwhelming. You are right, since I started blogging my TBR pile exploded! I come across so many more books and I don't seem to have any inhibitions to buy books. Daaaaaaamn! That's a lot! You're gonna laugh at my puny answer! I had my TBR pile under control for the longest time since I was unemployed but with my part time job now I've been slacking. But it's still not even a fraction of yours! Thanks! And I'm hopping over to visit. It's almost embarrassing. It's that 1-click buying thing I tell you. It gets me every time. I've stopped putting books on my shelves. I've just started stacking them beside my bed. I think I have a problem. That...is a lot more than I have. I hope. I think. LOL! I only counted physical books on my shelves and that was about 50. I'm afraid if I get any kind of e-reader things will get way out of control! Hopping through. I need to be better about requesting books for review. I need to start collecting books for my iPad now that I have one. I upped my Goodreads goal from last year too! I definitely have too many because I feel overwhelmed and guilty instead of happy. I'm glad you hopped with me! And they say bloggers don't buy books. I definitely buy more now that I'm blogging! Much too easy. I never knew reviewing and blogging could we so tiring. I'm determined to have a better balance this year. I agree! I spend too much time blogging. I should say reviewing books rather than actually reading a book for my own enjoyment! You should definitely try something out of your comfort zone. I love zombie books! Read The Forest of Hands and Teeth by Carrie Ryan (YA) or Aftertime by Sophie Littlefield (Adult). Both are faves of mine. I haven't read too much in steampunk, but I'd like to give it a shot! A good ghost story...love, love Evenfall by Liz Michalski (Adult) and Lee Nichols books (YA). Oh wow! You have an impressive amount of books to read! :) I actually wish I had that many. lol! Enjoy them! Happy FF as well! You are right! People make too many assumptions. I'm embarrassed to even say how many books are on my book shelves. I will say it is an awful lot. My Kindle and then my iPad were definitely a bad influence in my book buying. Between Kindle, Kobo, and iBooks I probably have 400 books. Yikes! The thing is there is no way I'm ever, in my lifetime, going to be able to read all the books I have. Lol. That's not even including all the review books I still need to get to. Can you say addiction??? LOL. I did not count my TBR list. I only counted books I literally have. I hope to increase my reading but I'm not going to challenge myself to do so. I have four weddings to plan, one in the Vrigin Island and a family reunion to host. I'm hoping to finish all the challenges I signed up for. eeek (rethinking) I have not put any books on the IPad, but my e-reader, thats another thing. Good luck with your goals, hun! I didn't realize it till recently. I need to stop that. It is seriously stressing me out. I have so many books I need to read as well - and I feel the pressure to get it done weighing on me. I'm trying not to read too many review books all at once, but then, there are so many on my list (though not as many as you have)! Semi off-topic: I love my iPad! Isn't it the coolest/most awesome thing ever? It has its limitations but it's great for my purposes (surfing the web, playing games, reading) so I can't complain. You can read my TGIF post here! Oh man . . . I've been resisting counting my TBR shelf, but today I went and did it. 95! That's enough to see me through 2 years worth of reading. For me too. It's weird because I'm always so excited when I request them but... it never fails...I get behind. Thanks for the recommendations. I just went and bought Haunting Violet and Soulless. I'll let you know how they turn out for me. Yay! Now I'm excited. I'm going a bit crazy because it is new but I'm slowing down because I haven't figured out a way to organize them on the iPad and I just can't have all those books together like that. How will I ever figure out which book I'm in the mood for?! New follower! I have so many books in my netgalley account. I always find that those are the hardest to get around to. Looking forward to your posts! Blogging has definitely fueled my addiction to reading and I didn't think that I could possibility want to read/own books any more than I already did when I first started out! One of the best Steampunk books I've ever read is: Soulless by Gail Carriger! I highly recommend it! You have some fantastic goals! Goodluck! Good luck for your reads! Stop by and check out my TGIF and Follow Friday post!